Just because you’re doing a grownup activity like cycling does not mean that you have to wear boring, solid color cycling gear on your rides. 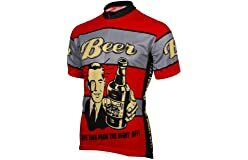 Instead, you can let your personality shine with a novelty cycling jersey. 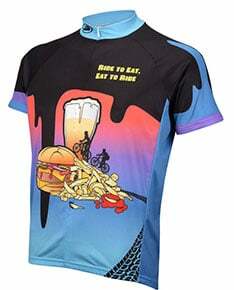 Out of all the novelty bike jerseys on the market, we’ve selected this on as our favorite for 2018. It is an item exclusive to Performance Bike and looks great when you’re out on a ride. 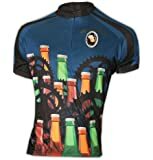 There are endless options when it comes to finding one to wear – you can opt for a funny cycling jersey, one for your favorite sports team or another unique cycling clothing option that lets the world know that you are one cycler who enjoys a good time. 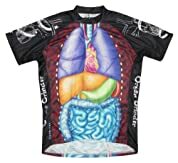 I want to share some of my favorite options, but know that there are lots and lots of cool cycling jersey designs and styles that you can buy online. If you’re not really sure where you should be shopping some awesome cycling jerseys for your next ride, then let us help you out. While your local bike shop might have a few good options for you, we suggest checking out the online stores listed below for some good variety. 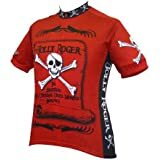 Though there are other places you can find good bike jerseys, the stores listed above are some of our recommended places for you to find these. 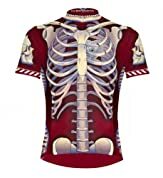 When it comes to cycling wear that make you LOL, no one does it better than Corbah. And the nice thing about their clothing is that they are all gender-neutral, which means that these unisex jerseys for great for both male and female cyclists. Another cool thing is that Corbah makes theirs in a large size range, with most designs available in sizes small to XXXL, which means that they are great for cyclists of all sizes. 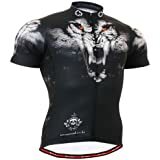 To give you an idea of what to expect from Corbah, take a look at my favorite crazy cool cycling jersey picks. As you do your shopping, you will likely come across even more great funny options. So, keep that in mind as you search online and in local stores. But hey, you can never have enough of these for riding, right? And no one wants to be the guy who wears the same jersey over and over! 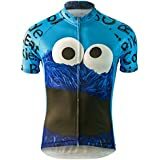 So, pick out a few to buy and rotate them out – you could even mix it up with a serious one…of course, there are far too many funny cycle jerseys to do that, right?! Sometimes, you just want to put on a jersey that will leave all the drivers who pass you scratching their heads, right? 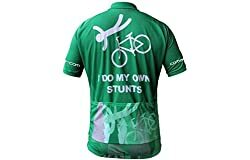 Or, maybe you’re like me and you have a group of friends who try to “out crazy” each other with the wackiest cycling attire available for purchase. 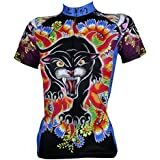 Well, if crazy is your preferred variety when it comes to getting dressed to ride your bike, then here are some of my favorite choices when it comes to cycling shirts. As you can see, these designs are a bit more crazy than your standard jersey. Also note that some of them are also available in a long-sleeve version, if you prefer to have long sleeves as opposed to the short ones. Personally, I get sunburned easily so I always enjoy having the longer sleeve option available to me. 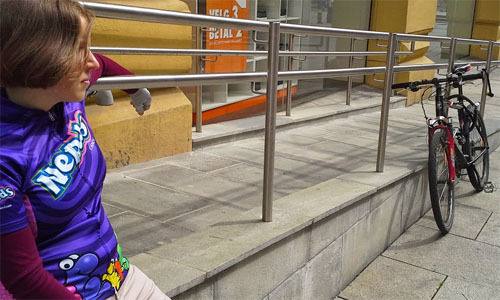 Keep in mind that these are just my current favorites when it comes to wacky cycling jerseys, but there are tons of other options out there. 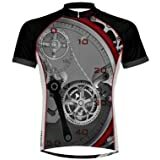 In fact, if you click on any of the items you see here, you will also be able to see other popular designs, which lets you know what other cyclists are wearing out there on the roads. 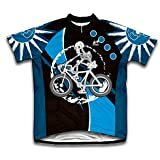 With so many options and designs available, you end up seeing a lot of cyclists out there on the roads with really cool and unique jerseys. However, there are some that really stand out to me as being a step above the rest. So, if you are interested in getting yourself something that really helps you stand out from the crowd when you’re biking, then check out some of my favorite options below. 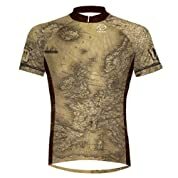 I love to travel, so the Primal Wear Lost Antique Map design is really one of my favorites. Just putting it on gives me a serious case of wanderlust. 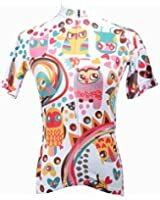 As I’m sure you already noticed, a lot of the really great and really unique and cool bicycle jerseys are made by Primal. 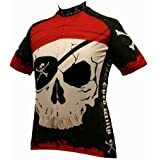 I highly suggest that you check out the rest of their designs as I am certain that you will find several really awesome cycling jerseys to choose from when it comes to buying a new one for your rides. And if you’re new to buying biking jerseys, then remember that you want to get a fit that is a bit on the snug side for better aerodynamics. Definitely do not get something that is loose fitting or baggy for your rides. Going out on your bike in biking clothes that are too big is definitely a sign of a noob cycler, so best to not do this. When in doubt about what size to get for a proper fit, check to see if there is a list of sizes and measurements from the manufacturer. By doing this, you get to be certain that you are ordering something that offers a perfect fit every time. Or, head down to a local bike gear shop and try on a few different sizes that are made by different brands and take notes on what is the best fit for you in each brand. Just like regular clothes, you will likely end up needing a different size for a few different brands. That is why it is so important to check those measurements for each size. And once you get your spiffy new cycling gear, get out there on those roads and show off those new threads!